Back to school means back to working with 30 little funny, messy, sticky, gooey students. It also means that everyone gets sick – including the teacher. Being a substitute teacher I work at different schools, meaning I basically can never build up any immunity to the students because I’m usually in a different class each day. Last week, I was in one class for the majority of the week as their regular teacher was out sick, with strep throat. Luckily, it meant I got to work all week, unluckily it meant I was probably going to catch whatever cold she caught. And I did. Thursday night I felt it, the sore throat, achey ears congested cough. I quickly self-medicated myself and loaded up on vitamin-c. After school friday I curled up on the couch and didn’t move for most of the night – hello 9 pm bedtime. all. weekend. long. Thankfully Adam was home this week and went out to get feel-better sushi Friday, because sushi is totally a meal you should eat when sick. Saturday was spent home for the most part, aside from a quick drive down the road to the park to walk the dog – i couldn’t go all weekend without enjoying the lovely sunshine. Sunday we had a pre-thanksgiving dinner with Adam’s family, since most of them are away next week visiting family back east. 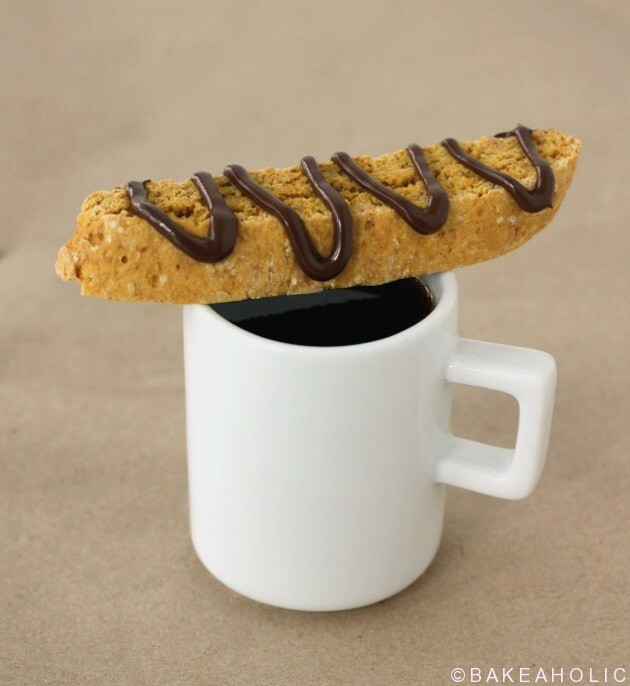 Adam had to tease me, since I don’t drink coffee (i know, i’m like not grown up enough yet to enjoy its dark caffeinated substance) however, I let him know that “i’ll drink anything if I can dunk a cookie into it” – and I will. Biscotti being one of them. Its dry, almost stale crunch is the perfect partner for a glass of hot coffee, or even tea. 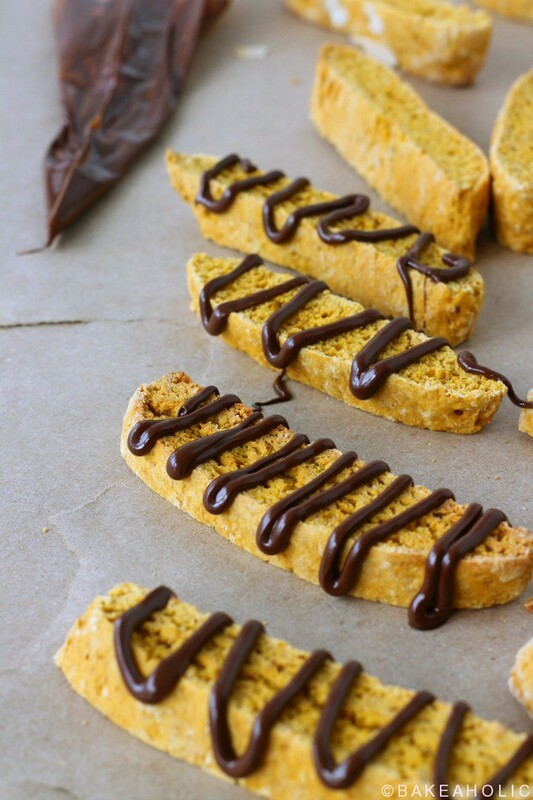 I’m not sure you’d find ‘pumpkin biscotti’ anywhere in Italy, and I’m sure my Nonna would prefer the regular anise biscotti, but I love this version for Fall, apologies to my heritage. 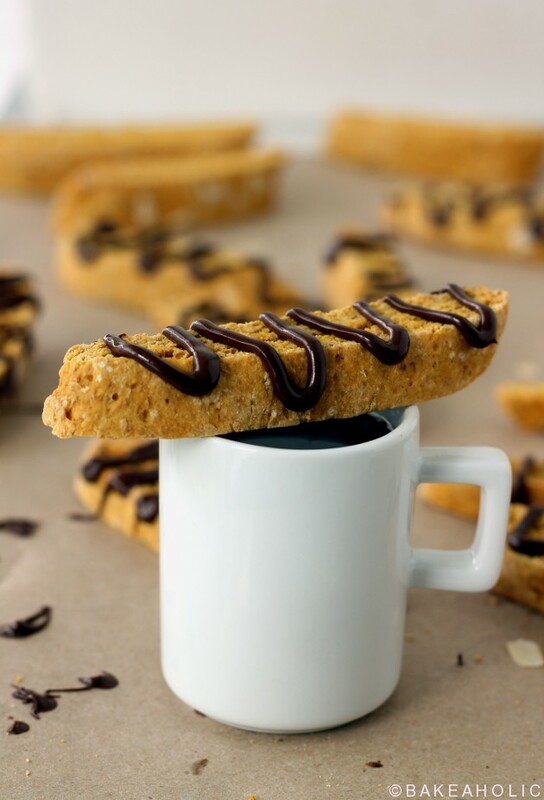 The cookies are great by themselves, and if you want to indulge go ahead and drizzle some chocolate on top. They also freeze well, make them ahead and take out for company. 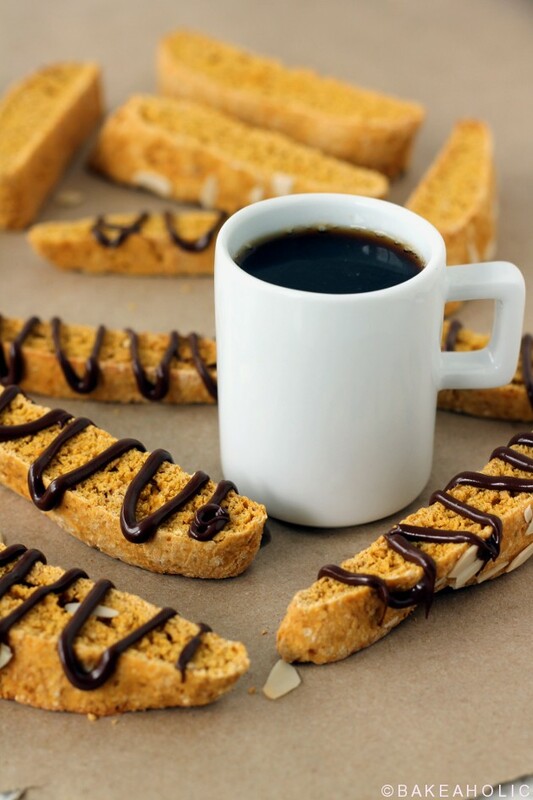 Biscotti might look daunting to make, but the cookies come together quickly and easily. A twice-baked lightly spiced pumpkin cookie, perfect for dunking in coffee or espresso. Sift together the flours, sugar, baking powder, and spices in a large bowl. In another bowl, whisk together eggs, pumpkin purée, and vanilla extract. Pour the wet pumpkin mixture into the dry flour mixture. Using a spatula, stir toy incorporate the ingredients, the dough will be loose and crumbly. On a clean floured surface, lightly knead the dough for a minute or two, until a slightly-elastic dough forms. On a lined baking sheet, form the dough into a large log, about 15-20 inches long by 3-5 inches wide. The loaves should be somewhat flat, only about 1/2 inch high. You can cut the dough in half, and bake the two side by side on the baking sheet. Bake for 25-30 minutes until lightly browned. Transfer to wire rack and let biscotti cool for 5 minutes. Carefully transfer to a cutting bird, and with a serrated knife slice at a 45° angle about 1/2-3/4 inch thick. Return the slices back to the baking sheet face up, and return to the oven for another 15-20 minutes. Cool completely, you want the cookies to be crisp. You can keep them on the counter overnight to dry further. Alternatively, you can use pumpkin pie spice. 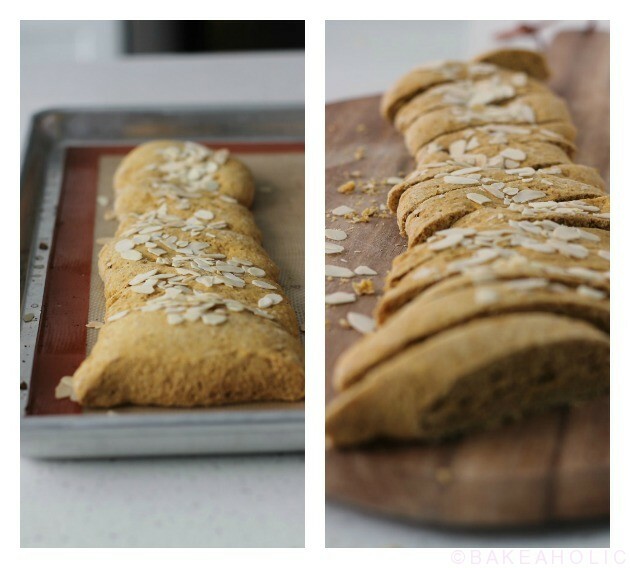 You can top the biscotti with almond slices before baking, if you like. To drizzle with chocolate, melt dark chocolate with a tsp. of coconut oil, stir and pipe or drizzle on top. Allow to harden on counter or in fridge. These look great – pinning! They look better then ever !